Vinnie Vinh is the chip leader once again with 520,000 and a talented stable of professionals surrounds him at the top. Phil Collins, J.C. Alvarado, and Tim Phan continue to play strong as this tournament continues to play late into the night. Soin Nguyen raised to 5,500 under the gun and Jonathan Aguiar and the big blind made the call. The flop was dealt 10 7 4 and the big blind checked. Nguyen bet 7,500 and Aguiar raised to 21,900 total. The big blind was eliminated, Aguiar dropped to 95,000, and Nguyen shot up to 220,000. Tom Braband bet 5,100 from the hi-jack and the big blind made the call. The flop came 10 5 5 and the big blind checked. Braband bet 7,000 and his opponent check-raised 20,500 total. Braband made the call. The turn brought the 3 and the big blind moved all in for 100,200. Braband went into the tank for quite some time. He spends about ten minutes in the tank before some of his opponents called the clock. He eventually mucked after that and although he left some chips on the table for his opponent he still held strong with 300,000. West was eliminated on the hand. Karr doubled up to 64,000 after the hand. A short stacked Tom West got the rest of his chips in the pot with A Q against Jason Young’s A K . The board came 4 3 3 8 6 , giving both players a flush, with Young having the best of it and Tom West being eliminated in 8th place ($12,422). 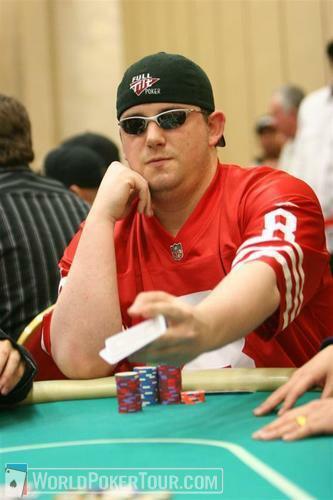 On a side note, that makes 2 shootout final tables for the West brothers so far in this year’s WSOP, his brother Tim West placing 5th in Event no. 11 ($5,000 NL Shootout). Matt Giannetti came in for a raise on the button and Kyle Bowker shoved all in from the big blind. Giannetti called. Giannetti held the lead going to the flop where Bowker made an open-ended straight draw. The nine on the turn made Bowker’s straight and Matt Giannetti was drawing dead on the river. Kyle Bowker doubled up while Matt Giannetti took a slight hit to his stack.